This is even more funny if you work the same place I do and know that I have already been through this same exact problem earlier this year. On Febraury 14th, 2007 when i came into work I was confronted with a similar scene. 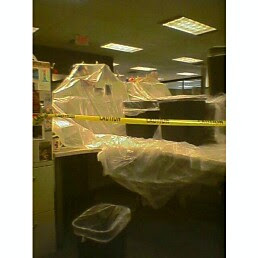 There was no caution tape but there was plastic on my desk because water leaked in through the ceiling tiles. Well it took them a month to fix it the first time, and I had just recently got my desk back in order. Now today I come in and no there was not the plastic and stuff, but I looked up and I see 2 moisture spots on the ceiling tiles. Well it quickly developed into a torrent of water. I had to move to a work station behind me to get signed in. Well the water followed me (like woodstock in the peanuts cartoon) and so I had to move yet AGAIN to a work station in a different section. I wander how long it will take them to fix this now.